NORTHEAST HARBOR– Robert S. Neuman’s bold expressionism collides with Philip Sultz’s meditative primitivism at Star Gallery. The exhibition opening is on Thursday, August 16th from 5:30- 6:30 p.m at 6 Neighborhood Rd., Northeast Harbor, ME 04462. The exhibition will be on view through August 29th. 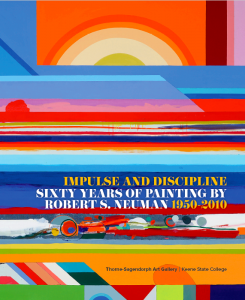 Works in the show by Neuman are drawn from the recent retrospective Robert S. Neuman: Impulse and Discipline at Thorne-Sagendorph Gallery at Keene State College, the Allan Stone Collection and works inspired by the Mount Desert Island landscape just outside of the gallery’s doors. Neuman and Sultz have deep roots in Maine. In the 1960’s, Robert S. Neuman traded paintings with galleries and Mount Desert Island resident Allan Stone for a home on the island. Sultz is a longtime Maine resident and, like Neuman, is represented by Stone’s gallery Allan Stone Projects. The vibrant color palette and expressive use of line and form are on full display in this latest exhibition. On display, Winter Storm Schoodic interprets the flurry of snow and sea spray that collides on the Maine coast during the winter. 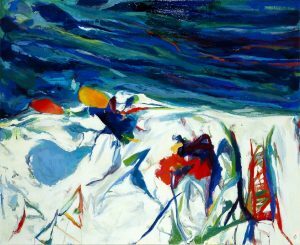 A combination of loose brushwork, and clash of bold hues of blue and white transport the viewer into this turbulent frigid landscape. Other works on display inspired by the Mount Desert Island landscape include works from Neuman’s Space Signs and Monuments series. They were inspired respectively by the symphony of heavenly bodies in the coast’s unpolluted night sky and the trail cairns that dot the island’s hiking trails. Philip Sultz’s artworks further ground the exhibition in the Maine outdoors. Sultz’s canvases are delicate strips of birch bark gathered from Maine’s forest floors. Small boats are painted on the rippled and striated surface of the bark, a material which subtly evokes the undulating water’s surface. The size of the works encourages close looking and may deepen the viewer’s appreciation of the sublimity of nature. Sultz’s career as an artist spans seven decades. During that time, he has produced paintings, collages and assemblages in a wide range of media. The crux of his artistry is an admiration for the structures found in nature. His matted, earth-toned color palette draws the viewers’ focus to his materials. The catalogue for Impulse and Discipline will be avaliable for sale at the exhibition. Catalogue contributor Carl Little will give a talk inspired by his essay A Lifetime of Art: Robert S. Neuman’s: Humanist Vision at Northeast Harbor Library on August 27th. Star Gallery is located in Northeast Harbor. The gallery exhibits contemporary-traditional artists from Maine and beyond the state’s borders. A visitor to the gallery can find diverse interpretations of the beauty of Mount Desert Island alongside fresh perspectives on 21st century artistry that draw inspiration from around the world.